BJC in award ceremony controversy shock!! 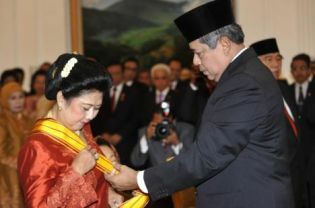 The Jakarta Inter League (JIL) is in turmoil today as it anguishes over BJC‘s (Bapak Jack Coldcall’s) award to his own wife, Annie, of one of the country’s highest awards, the Bintang Republik Indoneisa Adipradana – 2nd Class (BRIA2). The award ceremony took place yesterday at the Jagorawi Golf and Country Club near Cibinong, south of Jakarta. Also in attendance were Annie’s younger brother and recently appointed head of the army, Lt. General Pramono Edhie Wibowo, his wife’s cat, Budi, recently appointed Royal Mouse Catcher to the Palace at Surakarta and immediate past UK Ambassador to Indonesia, Martin Alan Gobfull together with some leading lights from the GOD Party who remain stubbornly out of jail. Previous holders of the award include many resistance fighters from the Dutch and Japanese era including, perhaps most famously, National Heroine Dewi Prijonogo, who was to die at the hands of Japanese interrogators in 1943 having bravely refused, during several days of gruesome torture, to reveal the whereabouts of fellow resistance fighters in their Depok area base. This apparently self-inflicted controversy could not have come at a worse time for BJC as the Golfers of Democracy (GOD) struggles with public anger over widespread corruption in the party that is his creation and not least the publicity over the arrest in Cartagena of disgraced former Treasure of GOD, Paddy O’Finnion. A presidential spokesman who was not authorised to speak on the record told us that “the Bakso thing was tongue in cheek by BJC, his wife in fact was also absolutely meticulous at making sure his balls were washed and his clubs polished before every game, it is vital to the JIL that BJC is right in mind and body before every round”. Asked why BJC had only given his wife the BRIA second class, the spokesman suggested that this may be due to Annie “not putting enough sambal on his Bakso“. Asked for his views on the controversy, former Ambassador Martin Alan Gobfull remained characteristically diplomatic, saying only that “this is a wonderful occasion that celebrates this beautiful country’s diversity; where else in the world could a humble President’s wife get a gong for making Bakso?” Asked if he planned to get a Hash in while he was here, the Ambassador confirmed that he “would be running with the TGIS Hash tomorrow morning; it’s been weeks since I’ve had a decent down down, though I do hope they’ve forgotten about the helping illegal aliens thing“. This entry was posted in Corruption, Politics. Bookmark the permalink.